Arteum, with three stores in Paris as well as an online boutique, has introduced its Niki de Saint Phalle collection, created in partnership with the Niki Charitable Art Foundation. The collection includes tableware, stationery, and other items decorated with designs and images from Niki’s work. Other artists and designers with collections chez Arteum include such luminaries as Le Corbusier, René Magritte, Keith Haring, and Jean-Michel Basquiat. 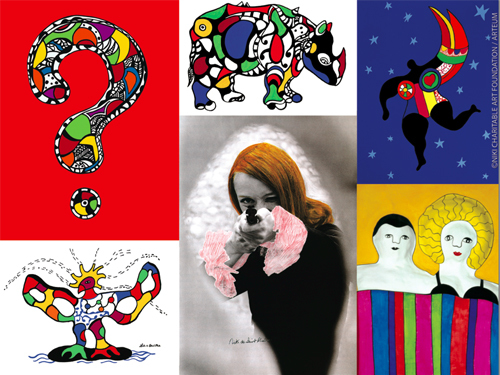 You can see items from the Niki de Saint Phalle collection here [.pdf] or visit the Arteum web site. Exquisite Corpse, a sequel to the exhibition presented under the same name at the Galerie Georges-Philippe and Nathalie Vallois in 2003, presents a body of work inspired by the famous game invented in Paris in 1925, in a house on the rue du Château where Marcel Duhamel, Jacques Prévert, Yves Tanguy, and many others, famous and unknown, would regularly meet. For them, the game was a way to explore the operation of thought beyond the control of reason, and it became a canonical device in the Surrealist toolbox. This exhibition offers fifteen surreal ‘exquisite corpses’ by such artists as André Breton, Paul Eluard, René Magritte, Man Ray, and Yves Tanguy alongside a selection of other works by contemporary artists embodying the same free and transgressive spirit. Among these works is Le Château de Gilles de Rais (The Castle of Gilles de Rais), a shooting painting created by Niki de Saint Phalle in 1962. 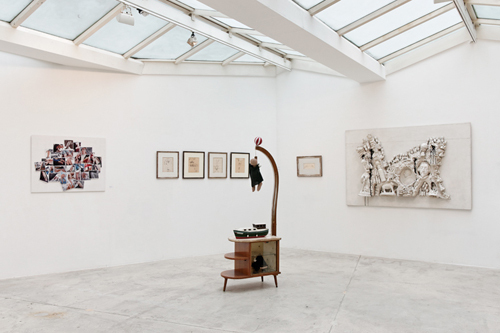 The exhibition, which opened on 22 March and runs through 11 May 2013, is on display at the Galerie Georges-Philippe and Nathalie Vallois, 36, rue de Seine, 75006 Paris. For more information, call the gallery at +33 (0)1 46 34 61 07.